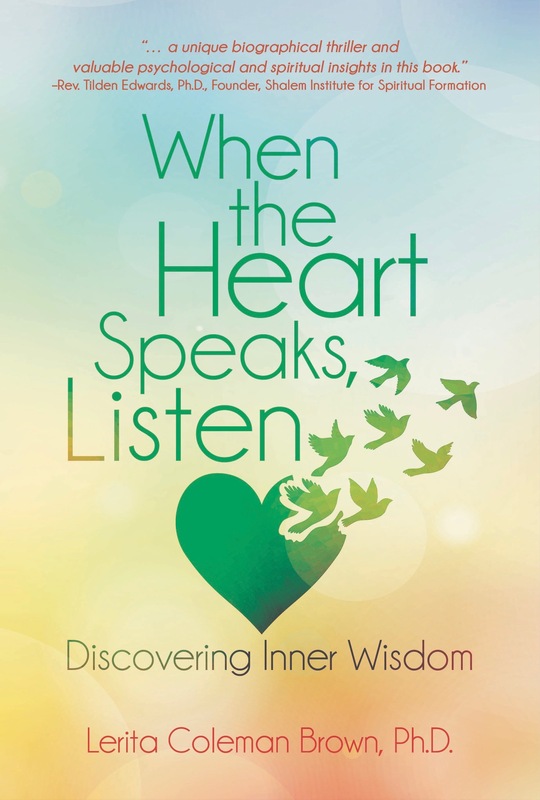 Read about how I survived a heart transplant 24 years ago by talking with and listening to my heart. This book is now available online at blackrosewriting.com, charisbooksandmore.com, Amazon, Barnes & Noble, Books A Million and can also be ordered through your favorite independent book seller. Rev. Tilden Edwards, PhD, Founder and Senior Fellow, Shalem Institute for Spiritual Formation, author of numerous books. Lerita is courageous–literally. Her willingness to share these conversations with her hearts–both of them–left me awestruck. I read this book through tears as my own heart vibrated at the lessons I need to learn in my own life. There is Truth in this book. Be prepared. You will be transformed. Rev. Dr. Stuart Higginbotham, Rector, Grace Episcopal Church and co-editor of the upcoming book, Contemplation and Community. Arthur C. Jones, Ph.D., Clinical psychologist, professor, author of “Wade in the Water: The Wisdom of the Spirituals and Founder of the Spirituals Project. Beth Darnall, Ph.D., Clinical Professor, Stanford University School of Medicine, author ofThe Opioid-Free Pain Relief Kit, Less Pain, Fewer Pills, and Psychological Treatment for Chronic Pain. I complete this series on cultivating patience and trust with a lovely prayer by Pierre Teilhard de Chardin, SJ. These inspiring words spark a sense of hope in me especially on those days and in those moments when I feel weary on the journey. excerpted from Hearts on Fire. As I yearn for more vitality and verve, I remember that patience is also about trust. It is trust that after all of the waiting, a healing outcome awaits me. I believe that someday my full energy will return and I will use it for something that moves me beyond a life that necessarily focuses on my schedule, my personal needs and desires. Waiting tends to highlight everything that isn’t working or feeling right without considering that it is likely to change tomorrow. By accepting the call to the transplant journey and all of the lessons that it entailed, I learned to trust that whatever I needed would be provided. I trusted that a new heart would arrive before the old one ceased. I trusted that a kidney donor would emerge so I wouldn’t be tied to a dialysis machine three times a week. I believed that somehow the bills would be paid even though I couldn’t work during my recoveries from various illnesses. It is easy to lose patience, to get caught up in the “I want it now” world that whirls around me. From the depths of a life absent of delayed gratification, I attempt to exert my own will over time and how it operates, over doctors and pharmacies and how they quickly they take care of me. I desire cashiers to move quickly, to promptly take care of the people ahead of me in the grocery store line or at the local cafe. I want people to hurry at the ATM, to fill their gas tanks at record speed. I, like many people wish everyone and everything would move faster because my plans do not allow for too much waiting. Yet if errors occur I’d be the first to become outraged by a perceived incompetence. I suppose I have not totally embraced the lessons I thought I had mastered about trust from my many years of waiting. I wonder why I am so resistant to the trust inherent in the practice of patience, why I must rehearse it like a piano lesson or sports training. Certainly to develop strong trust, I must engage in smaller acts of surrender. I recall the times when the anesthesiologist placed the mask on my face in the OR and told me to count down from 10. I trusted that I would wake up somewhere and see the familiar faces of those I loved. I hoped that there would be an end to my suffering and I would return to my normal schedule of waking up in my own bed, preparing breakfast, driving to work, or just sitting on my deck before a forest of trees and singing birds. Last time I took a silent retreat, I stumbled across a book on the crowded book shelves of the large reading lounge/kitchenette, a room filled with overstuffed couches, padded lounging and rocking chairs with a window open to endless bird watching. In Jesus, A New Vision-Spirit, Culture, and the Life of Discipleship, Marcus Borg states that faith must move beyond mere belief and become radical trust in God, an unprecedented reliance on the Force of Love that created me, us, and the universe. Radical trust in something other than myself, doctors, and medications is essential to my experience of peace and joy. The idea of letting go used to be scary. Now knowing that I don’t have to manage or take care of everything is comforting. As I prepared for my first transplant I engaged in a series of conversations with my heart. My old heart, so full of wisdom whispered to me one day that there were four things I needed to master to successfully survive a transplant and thrive for rest of my life. “Listen, trust, patience, and surrender” it murmured. Pause, be still and listen to the guidance that is always present. Trust the still, quiet voice of inner wisdom over the many chanting voices that emerge from old wounds, fresh wounds, shortsighted family or friends and the media. Be patient since my timing may not coincide with a Universal timing. And surrender–give up trying to control everything because it is simply impossible. Thus, surrender is essential to the trust required for patience. It’s the relinquishing control over how and when the healing will unfold and accepting each day as it comes instead of creating relentless plans that are frequently uprooted by life. Yes, life—traffic delays, a sudden phone call announcing that a loved one is terminally ill, a friend needing bail money or sobbing because a spouse has filed for divorce. I cannot change circumstances but I am able to listen for my role in assuaging the suffering be it a loving and peaceful presence, a listening ear or temporary holder of anguish and anxious concern. I don’t like suspense, a sense of not knowing. I don’t like dwelling in the liminal space—not there yet but not here anymore. I am more comfortable with predictability. Yet I believe that some unseen Force is working somewhere, somehow with me to orchestrate my life. Trust and patience—two interconnected paths that need nurturance and work, and hours of practice, going over the same ground again and again and again. So in what areas do you need to cultivate trust? Do you possess the trust that patience demands? How can trust and patience help to eliminate or dissipate anxiety, anxiousness, or sadness and allow you to feel more of the Peace and Joy in your heart? Where are you on the journey to patience, to learning the balance between taking charge at every step and surrendering, receiving the gifts that only waiting can provide? Like a train stop on the road to a new inner destination, how is patience being nurtured in you? How is patience working to unearth more of the Peace and Joy in your heart? I haven’t posted to my blog in a few months. I miss writing about maintaining peace and joy. I was forced to shift my attention elsewhere when I began a protocol to wean off of prednisone. For organ transplant recipients, prednisone is a steroid used to suppress the immune system and prevent organ rejection. When I first began taking prednisone some 21 years ago, I took a fairly high daily dose although for the last 10 years it has been reduced to 5 mg/day. Over the years I’ve received the “prednisone blast” for various bouts of rejection. In most transplant centers, a serious rejection episode elicits 1000 mg of prednisone I-V (known as solumedrol) for 3 days in a row. Because my early rejection issues weren’t treated aggressively enough, in 2000 from January to June I received 13,000 mg of solumedrol. My body, inundated with steroids felt like an overblown, bloated balloon. Over a period of about four weeks, each day I could feel a tiny trickle of steroids slowly ebb from my head to my shoulders, passing through my back and abdomen, down my legs and finally seep out of my toes. Unfortunately I’m allergic to contrast dye so each year for my annual heart catheterization, I receive a very high dose of prednisone as a way of quelling any reaction. Such blasts led to debilitating fatigue because the adrenal glands are most susceptible to the prednisone beatdown. I’d wanted to stop taking prednisone for a long time but was always fearful that discontinuing it would trigger another rejection episode and as a consequence I would have to take more. Long term use of prednisone frequently causes weight gain, fluid retention, increased blood sugars raising the probability of developing diabetes, early cataracts and glaucoma, osteoporosis, mood changes and adrenal gland suppression. I had experienced all of these and knew I did not want to become a diabetic, break any more bones, or undergo cataract surgery. This year felt like the right time to intentionally change the course of my health by requesting that I eliminate prednisone from my medical regimen. Since that time, my listless adrenal glands so used to the prednisone working for them, have failed to secrete ample cortisol. They have been unable to resume their role as producers of the natural steroids that give me the zip I need to get through the day. Feeling extremely exhausted I’ve lacked the energy to write, sew, cook or do much more than read or rest. Fortunately I haven’t suffered much stress lately because my adrenal glands are in no shape to mount a response to any kind of trauma. In continuing my life-long recovery, I’ve learned many lessons, and the biggest is about patience. I’ve been reminded during this now more than two month ordeal that patience is about timing but typically not my timing. Patience is about waiting and I, firmly immersed in our fast paced world, find the practice of patience exceedingly challenging. Earlier in my life, when I pushed through college and graduate school, and even attempts to obtain tenure, I felt I had mastered delayed gratification. As I’ve gotten older I still find I must muster up patience with myself, with others and the slow process of healing. I thought I would have cultivated the art of patience by now especially since I’ve been presented with so many opportunities. I think of the time I’ve spent waiting; waiting in doctor offices, post-op recovery rooms, and pharmacies. I am grateful, however for the progress I’ve made from my initial days as a transplant recipient. I used to sit in clinic, watching the clock, often growing resentful about what I could be doing with all that time I felt I was wasting waiting. Sitting on the burgundy and navy blue leather chairs and couches, with lamps and indirect sunlight I pretended to read, but what I really wanted was for someone to call my name so I could finish the x-ray or speed up the echocardiogram and get on with my day. Now I realize that waiting is just as important to life as the things on my preferred “to do list.” When I reflect on my state of impatience, I feel the poignancy of my self-absorption, emotionally and cognitively. I was thinking primarily about me, my time and my life. But what about all the others who shared this waiting space with me in clinic? What about the newly transplanted, anxiously awaiting news about possible rejection or those in heart failure wishing and hoping to just qualify for the organ waiting list that they might have to occupy for years? It occurred to me one day that perhaps I could use the waiting time to encourage and uplift recent transplant recipients with my stories of triumph, I could demonstrate to those waiting for heart transplants that there is the possibility of a good life once they receive a new heart. Often I elicit surprise and shock by my healthy physical appearance, at the spark I radiate after being a heart transplant recipient for over 21 years and a kidney recipient for over 11 years. Now I wait with much petitionary (“Please somebody give me some energy!”) and contemplative prayer (being still and listening for guidance), and I’ve started to receive answers. First I learned that cardiologists are not endocrinologists and although my transplant team believed they were weaning me off prednisone at a reasonable schedule (2 months), I learned from an endocrinologist that people who have taken steroids as long as I have cannot be weaned so abruptly. It actually takes more like 4-6 months. She assured me that my adrenal glands would wake up eventually but I need to give them more time, time for a gentle stirring, a gradual awakening. Yes, more waiting, a seeming metaphor for my life and my spiritual journey. I am struck by this notion of a gradual awakening of something that has been asleep for a long while. I suppose just like my adrenal glands lulled to sleep by prednisone many years ago, I am also waking up to a new spirit or sense of who I am. Of course I want the spiritual awakening to move much faster, perhaps in a flash or overnight. My arrogant ego wants to orchestrate the awakening perhaps thereby blocking something more intelligent and grander which may be working simultaneously to diminish my suffering. I am comforted by the notion that I am not the only one resisting the liminal space, the only person sitting in a perennial holding pattern, waiting to wake up in a new expanse of Peace and Joy. Whether it be hospitals or monasteries, war zones or prayer circles, there are so many communities of people, waiting. What is it that you are waiting for right now? How is patience being cultivated in your life? As you pay closer attention, what is life showing you through the waiting? What are you being called to do or be in the waiting time? Perhaps there is some way to inspire and encourage others who share your path of waiting. There is a reason why patience is considered a virtue and often its cultivation may help to uncover more of the Peace and Joy in your heart. Photo by Columbus H. Brown of Candid Imagery Fine Art.